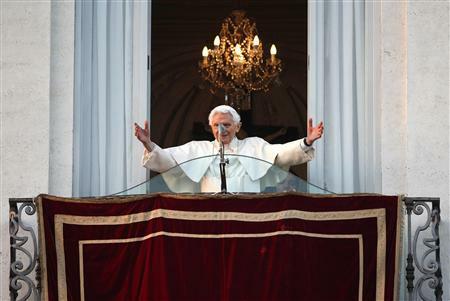 A short time ago, Pope Benedict XVI told a crowd of thousands at Castel Gandolfo that he would shortly no longer be pope, and would be a simple pilgrim on the last part of his journey, dedicated to serving the common good. It was his last public appearance as pope. And referring to the disciples of Emmaus, I would like to say to you all that it has also been a joy for me to walk with you over the years in light of the presence of the Risen Lord. As I said yesterday, in front of thousands of people who filled St. Peter’s Square, your closeness, your advice, have been a great help to me in my ministry. In these 8 years we have experienced in faith beautiful moments of radiant light in the Churches’ journey along with times when clouds have darkened the sky. We have tried to serve Christ and his Church with deep and total love which is the soul of our ministry. We have gifted hope that comes from Christ alone, and which alone can illuminate our path. Together we can thank the Lord who has helped us grow in communion, to pray to together, to help you to continue to grow in this deep unity so that the College of Cardinals is like an orchestra, where diversity, an expression of the universal Church, always contributes to a superior harmony of concord. I would like to leave you with a simple thought that is close to my heart, a thought on the Church, Her mystery, which is for all of us, we can say, the reason and the passion of our lives. I am helped by an expression of Romano Guardini’s, written in the year in which the Fathers of the Second Vatican Council approved the Constitution Lumen Gentium, his last with a personal dedication to me, so the words of this book are particularly dear to me. This was our experience yesterday, I think, in the square. We could see that the Church is a living body, animated by the Holy Spirit, and truly lives by the power of God, She is in the world but not of the world. She is of God, of Christ, of the Spirit, as we saw yesterday. The Church lives, grows and awakens in those souls which like the Virgin Mary accept and conceive the Word of God by the power of the Holy Spirit. They offer to God their flesh and in their own poverty and humility become capable of giving birth to Christ in the world today. Through the Church the mystery of the Incarnation remains present forever. Christ continues to walk through all times in all places. Let us remain united, dear brothers, to this mystery, in prayer, especially in daily Eucharist, and thus serve the Church and all humanity. This is our joy that no one can take from us. Prior to bidding farewell to each of you personally, I want to tell you that I will continue to be close to you in prayer, especially in the next few days, so that you may all be fully docile to the action of the Holy Spirit in the election of the new Pope. May the Lord show you what is willed by Him. And among you, among the College of Cardinals, there is also the future Pope, to whom, here to today, I already promise my unconditional reverence and obedience. For all this, with affection and gratitude, I cordially impart upon you my Apostolic Blessing. This entry was posted in Uncategorized and tagged pope benedict xvi. Bookmark the permalink.